a record of data in graphic or tabular form. Amsler c's a set of charts used for the detection and measurement of visual field defects. The charts consist of various geometric patterns, such as grids or parallel lines, printed in white on a black background, with a dot in the center. The patient looks at the dot with one eye closed; defects in the visual field will cause the patient to see irregularities or blank spots in the pattern. 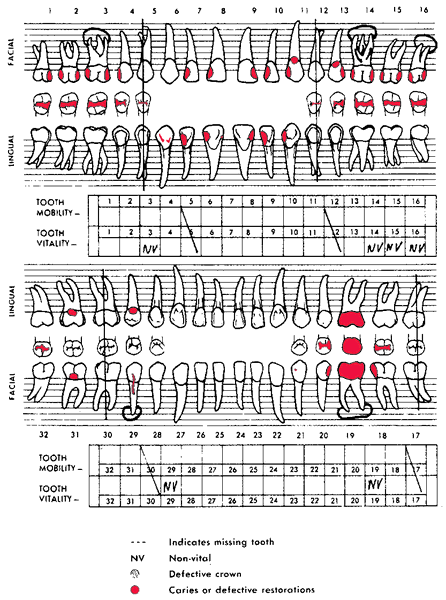 Dental chart showing caries and defective restorations. Adequate restorations are not charted. From Barsh, 1981.
genealogical chart a graph showing various descendants of a common ancestor, used to indicate those affected by genetically determined disease. reading chart a chart with material printed in gradually increasing type sizes, used in testing acuity of near vision. Reuss' chart a chart similar to the Ishihara chart for testing color vision. chart rounds review of a hospitalized patient's current records by a group of health care professionals. Chart rounds can be undertaken for a variety of reasons such as assessment of patient progress, planning of interventions, or education of staff. Snellen's chart a chart printed with block letters in gradually decreasing sizes, used in testing visual acuity. 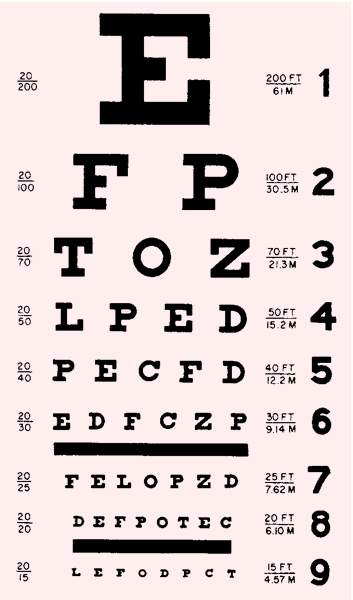 The Snellen chart is used to assess distant vision. From Malarkey and McMorrow, 2000. 1. A recording of clinical data relating to a patient's case. 3. optics symbols of graduated size for measuring visual acuity, or test types for determining far or near vision. (chahrt) a record of data in graphic or tabular form. reading chart a chart printed in gradually increasing type sizes, used in testing acuity of near vision. Reuss' color charts charts with colored letters printed on colored backgrounds, used in testing color vision. Snellen's chart a chart with block letters in gradually decreasing sizes, used in testing visual acuity. a patient record of data in tabular or graphic form. 2 v, to note data in a patient record (computerized or paper), usually at prescribed intervals. noun A formal document that includes relevant data, records, reports–eg radiology, pathology, of a person's medical Hx. See Bar chart, Hospital chart, Organized chart, Run chart, Subway chart verb To place orders, progress notes or data in a person's chart. 1. A record, hand written or on computer, of clinical data relating to a patient's case. 2. Synonym(s): curve (2) . 3. ophthalmology symbols of graduated size for measuring visual acuity, or test types for determining far or near vision. 4. To record clinical data relating to a patient's care. Acronym for Continuous Hyperfractionated Accelerated Radiotherapy, a form of treatment for non-small-cell lung cancer that has produced a significant improvement in survival compared with conventional radiotherapy. A tabular presentation of test targets for assessing vision. 2. A recording of clinical data relating to a patient's case. 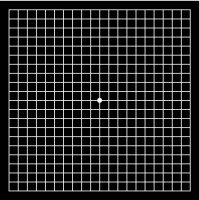 Amsler chart One of a set of charts used to detect abnormalities in the central visual field which are so slight that they are undetected by the usual methods of perimetry. There are various patterns, each on a different chart, 10 cm square. One commonly used chart consists of a white grid of 5 mm squares on a black background. Each pattern has a dot in the centre, which the patient fixates. When fixated at a distance of 30 cm the entire chart subtends an angle of 20º. If there is any visual impairment (usually as a result of macular disease) it is demonstrated by the absence or irregularities of the lines (Fig. C6). Syn. Amsler grid. See age-related macular degeneration; metamorphopsia. astigmatic fan chart A test pattern consisting of a semicircle of radiating black lines on a white background for determining the presence and the amount, as well as the axis of ocular astigmatism. If the chart resembles the 'clock face' type it is called an astigmatic dial or clock dial chart (Fig. C7). 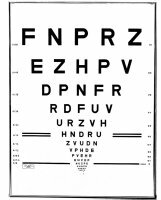 Bailey-Lovie chart A visual acuity chart with letter sizes ranging from 6/60 (20/200) to 6/3 (20/10) in 14 rows of 5 letters. Each row has letters which are approximately 4/5 the size of the next larger letters and the letters in each row have approximately the same legibility (within ±10%). It is most useful with low vision patients. This is the most commonly used type of log MAR charts (Fig. C8). There is also a Bailey-Lovie Word Reading Chart for near vision. It is composed of words rather than letters. The size progression of each line is logarithmic. The typeface used is the lower case Times Roman customarily used in newspapers and books, and the range of sizes varies between 80-point and 2-point print (or the Snellen equivalent at 40 cm of 6/144 or 20/480 to 6/3.6 or 20/12, respectively). There are 20 such charts, each with a different set of words. See near visual acuity. clock dial chart See astigmatic fan chart. contrast sensitivity chart A chart designed to test contrast sensitivity. Such a test is useful with patients having low vision and in the early detection of diseases. Examples: Pelli-Robson chart; reduced contrast Bailey-Lovie near log MAR letter chart. See Teller acuity cards; Arden grating test; Vistech. illiterate E chart Chart for carrying out a subjective visual acuity test on a person who cannot read. It consists of a graduated series of the Snellen letter E orientated in various directions which the subject must recognize. This procedure is sometimes called the 'E' test or 'E' game. See Teller acuity cards; 'E' game; Cardiff acuity test. Landolt broken ring chart A visual acuity chart using a graduated series of Landolt rings in which the target thicknesses and gaps are equal to one-fifth of the outer diameter. The subject must indicate the orientation of the gap, which usually appears in one of four directions: right, left, up or down. This test is less subjective than the Snellen chart. Syn. Landolt C chart. log MAR chart A visual acuity chart in which the rows of optotypes vary in a logarithmic progression. The multiplier of the geometric progression is usually equal to 1.2589 or 0.1 log unit. On one side of such a chart the rows of optotypes are usually labelled with the traditional Snellen notation. On the other side of each row visual acuity is labelled as the logarithm of the minimum angle of resolution (log MAR), which is the logarithm to the base 10 of the angular subtense of the stroke widths of the optotypes at a standard distance. See Bailey-Lovie chart; Glasgow acuity cards. Pelli-Robson chart A contrast sensitivity chart consisting of eight lines of letters, all of the same size, subtending 3 degrees at a viewing distance of 1 m. On each line there are two groups, each containing three different letters; the letters in each group have the same contrast. The contrast of the different letters in each group decreases by a factor of 1/2 and the range of contrast varies between 100 and 0.6% in 16 steps. The subject is asked to read the letters starting with those of high contrast and continuing until two or three letters in one group are incorrectly named. The contrast threshold is represented by that of the previous group of letters. The chart gives the results in log contrast sensitivity. This test provides a measurement of contrast sensitivity at low to intermediate spatial frequencies depending upon the viewing distance. Syn. Pelli-Robson contrast sensitivity test. Raubitschek chart A test target for determining the axis and the amount of astigmatism of the eye. It consists of two parabolic lines (known as wings) in an arrowhead pattern, parallel and closely spaced at one end, and each diverging from each other through a 90º angle at the other end. There are several methods of using this test. Syn. Raubitschek arrows; Raubitschek dial. reduced contrast Bailey-Lovie near log MAR letter chart A set of 30 Bailey-Lovie charts designed to measure contrast sensitivity. Each chart has a different contrast, half of the charts contains the letters of the distance Bailey-Lovie chart and the other half contains the letters of the near Bailey-Lovie chart. All the charts have the same average reflectance and the contrast of the charts ranges from 0.95 to 0.0013%. The charts are presented to the subject in order of increasing contrast and the subject reads the letters from the largest to the smallest lines that they are able to. Threshold resolution in log min arc is determined for each of the 30 charts and a contrast sensitivity curve can thus be determined. Snellen chart A visual acuity test using a graduated series of Snellen letters (or Snellen test types), in which the limbs and the spaces between them subtend an angle of one minute of arc at a specified distance. The letters are usually constructed so that they are 5 units high and 4 units wide, although some charts use letters that fit within a square subtending 5 minutes of arc at that distance. See Snellen acuity; Snellen fraction. test chart A board externally illuminated, an internally illuminated transparent sheet, a slide for projection or a computer based system which projects optotypes or other tests used in the subjective determination of refraction. Syn. letter chart. See legibility; optotype. Recording of clinical dental (or medical) data relating to a patient's case. n a sheet of paper or pasteboard that presents a graphic representation of a condition or state. n a diagrammatic chart of the teeth on which the findings from the clinical and radiographic examinations are recorded. n.pr (Bonwill-Hawley chart), graded outlines of dental arch sizes based on the mesiodistal diameters of the six anterior teeth. n forms and records for obtaining a thorough medical and oral history combined with a complete record of findings that enable the practitioner to gather and have on hand the necessary records to render total patient care. a graph showing various descendants of a common ancestor, used to indicate those affected by genetically determined disease. Q. I’ve been planning to start a fitness regime center for some time now. What’s the best way to chart it out? I am the breadwinner in my family. I did a business that was earning me substantially well. It was a fitness equipment selling business. My business met with a loss last year and now I’ve been planning to start a fitness regime center for some time now. What’s the best way to chart it out and keep track of what I’ve done? I should not meet with the same loss again. Already my family is upset with me. So please help! A. daronstorm, i'm not sure your question is medical..if i understand correctly- you are trying to open up a business and wish it to go well. in that type of business the hard thing is to get clients and to keep them. getting them is a matter of publicity, location,prices etc. keeping them- i suggest giving a whole treatment. that means not just a gym, hire a nutritionist ,trainers, and maybe think about putting a sauna and a jacuzzi too. the nutritionist and the trainers will build a workout plan together for the clients and you'll need some managers to do a follow up on the clients. did they met their goals? if not- what is missing? Screening at school using Snellen's chart showed prevalence of refractive error 8. Visual acuity was tested using Snellen's chart, anterior segment was evaluated using slit lamp. Inclusion criteria for the study, those who were doing hospital duties in shift, not retired, aged between 20 to 60 yrs, without any hearing difficulty as tested by tuning fork, without any visual difficulty as tested by snellen's chart and jaegger's chart, without any muscular disorder. If the nummular keratitis involved the visual axis the patients vision dropped by 2 lines in the distance visual acuity on the Snellen's chart. Visual acuity was assessed on Snellen's chart and anterior segment evaluation was done with slit lamp biomicroscope. The visual acuity was determined by Snellen's chart.